Egyptian composer and ethnomusicologist Halim El-Dabh passed away on 2 September in his home in Kent, Ohio, his wife Deborah wrote on social media. In the short obituary, El-Dabh's wife wrote that he was "a prolific composer as well as a performer, professor and ethnomusicologist. One of his most famous works is his collaboration with Martha Graham for a work entitled Clytemnestra. He has written scores for worldwide orchestras, dance companies, chamber orchestras and solo works." Born on 4 March 1921 in Cairo to a Coptic family, El-Dabh graduated from the agricultural engineering department of Fouad I University (now Cairo University) in 1945, yet his interest in music directed him to many explorations, first of folkloric expressions and soon electronic experimentations where he indulged himself in sound manipulation with wire recorders. He also used these tools to capture the sounds of the zaar ritual, exorcisms, and the streets of Cairo. He used those experimentations to compose his own music, becoming an early pioneer of electronic music. In the 1950s El-Dabh received a Fulbright Music Grant which took him to the Aspen Music Center, Colorado, where he met and assisted Igor Stravinsky, and studied with Aaron Copland and Leonard Bernstein at the Berkshire Music Center in Massachusetts, Amal Choucri Catta wrote about the composer in 2007 for Al-Ahram Weekly. At a later date, in New York, El-Dabh developed friendships with prominent musicians and became one of "Les Six d'Orient", representing the vanguard of contemporary composers inspired by Eastern music. Inspired by Béla Bartók, whom he met in Egypt at the Cairo Music Congress organised by King Fouad in 1932, El-Dabh organised many trips, during which he explored the musical traditions of different countries and cultures, documented them and incorporated into his own composing. Among the most significant trips were those to Ethiopia, Mali, Senegal, Niger, Guinea, Zaire, Brazil, among others. 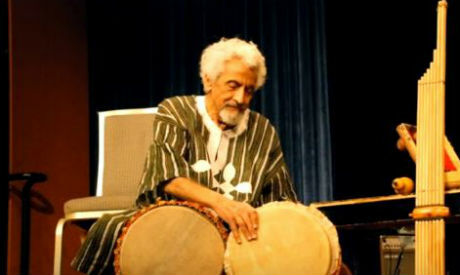 El-Dabh had taught at Kent State University's School for Music and at Howard University in Washington, among others. Choucri-Catta adds that among El-Dabh's numerous compositions, there are 11 operas, four symphonies, several ballets, concertos and orchestral works, as well as film scores, chamber and incidental music. He also wrote music for jazz and rock bands, electronic music and pieces for various combinations of African, Asian and Western instruments. El-Dabh's scores are published by the C. F. Peters Corporation and his music has been recorded by the Folkways and Columbia labels. He is survived by his wife Deborah, son Habeeb, and daughters Shadia and Amira.